Bomber® hats are quality made for people who love the outdoors! We built our reputation on this hat-which features an outer shell trimmed with 100% Natural Rabbit Fur. 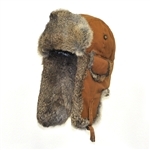 You'll also dig the recycled quilted lining in the crown for that great Mad Bomber fit, and sturdy earflaps that button down or up to let your ears doing their hearing thing. Need even more control? Our snap lock technology lets you keep your chin flaps on the top of your head or down around your chin. Even better, there's and embroidered MAD BOMBER logo right on the back of the hat. Waxed Cotton Bomber w/ Brown Fur. Ear flaps can be buttoned up for easier hearing. Chin strap can close snug around face or clip on top of crown as a cap. Grey Waxed Cotton w/ Brown Rabbit Fur. Kids Supplex Bomber w/ Grey Rabbit Fur.